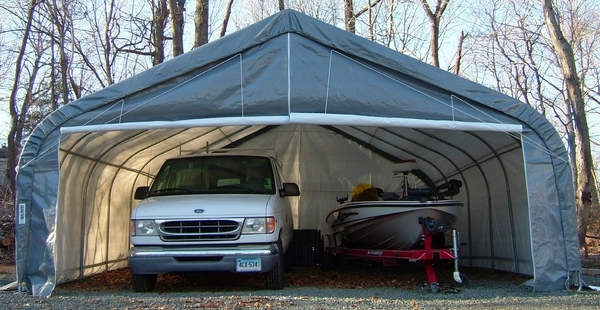 Running out of garage space can be a huge problem, but with this instant 2 car garage from Rhino Shelter, you can protect your vehicles and equipment from weather damage and keep them dry and safe. The easy assembly process can be completed in about 2 hours, and the complete drive through design allows for good ventillation and convenient use. The heavy dutty frame and cover can protect your cars in almosy any weather conditions, and the roll up doors are easy to use and convenient. * Please Note: Shown In Grey. * Flame Certification: This item is CPAI-84 Flame Certified. Can these anchors be removed so that the garage can be positioned in a new location? If not, where can I get new anchors? The anchors that come with this are considered permanent. They cannot be removed from the ground without being dug up. We do not sell the replacements for these, however, you could purchase them directly from Rhino Shelter.